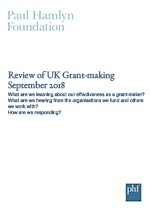 Today Paul Hamlyn Foundation (PHF) publishes the Review of UK Grant-making 2018. This report analyses learning from around 450 grants, from three years of grant-making under the current strategy. A rich data source for grantees, funders and those active in the fields in which we operate, the report pulls together emerging challenges, trends and the outcomes being pursued in efforts to advance social justice. This is the second such report released in this period, continuing PHF’s commitment to the importance of openness and transparency in philanthropy. It presents the types of organisations being funded, common approaches and methods being used and the major outcomes that grantees are working towards. With a three year cycle now complete for some grants, some interesting learning is emerging across our six strategic priority areas. The review reveals an increase in partnerships and in co-production practices, in which grantees collaborate with those they support to design and deliver work. The findings also highlight the importance of long-term and core funding, the value grantees place on convening and other forms of non-monetary support and the differences between making grants to individuals and to organisations. Much of the insight comes from our grant-making data and reports from grantees, the knowledge of our staff about the organisations and sectors that we support, as well as ongoing evaluation in specific areas. Over the coming year, this work will continue to inform our thinking about how best to support grantees to respond to the challenges they have identified as well as provide the support that is needed to foster innovative practice and grow impact.